In 1892, Andrew Taylor Still, MD, DO, opened the doors of a small, rural medical school in Kirksville, MO. This month, I am both proud and excited to join in the celebration of the 125th anniversary of this landmark college, now the A.T. 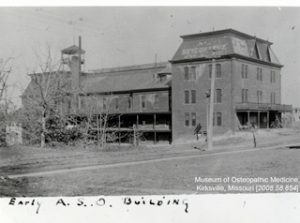 Still University-Kirksville College of Osteopathic Medicine (ATSU-KCOM), and how this revolutionary institution changed the trajectory of the medical profession forever. The American School of Osteopathy. 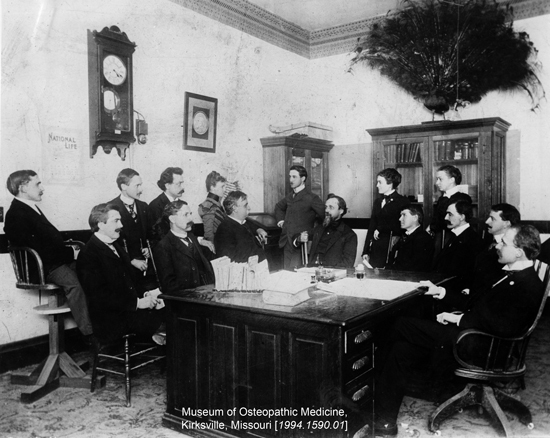 Courtesy of the Museum of Osteopathic Medicine, Kirksville, MO. The American School of Osteopathy—the first osteopathic medical college in the world—was not just another medical college perpetuating many of the ineffective, risky, and often harmful medical practices that were commonplace in that era. Instead, the curricula were built on the medical treatment model that Dr. Still had developed over decades of his research and clinical observations which he called osteopathy. His first class of 21 students was an inclusive and diverse group of men and women who believed in Dr. Still’s pioneering philosophies about patient wellness, preventative medicine, the body’s ability to heal and regulate itself, and treating illness within the context of the whole body. The first class contained five women, which was unprecedented during a time when medical degrees were awarded exclusively to men. • The body is a unit; the person is a unit of body, mind, and spirit. • The body is capable of self-regulation, self-healing, and health maintenance. • Structure and function are reciprocally interrelated. • Rational treatment is based upon an understanding of the basic principles of body unity, self-regulation, and the interrelationship of structure and function. There was no way for Dr. Still and his first class of students to know the true impact of what they started, yet, because of their work, osteopathic medicine is one of the fastest-growing medical professions in the nation. DOs are now licensed not only throughout the United States, but also have unlimited practice rights in more than 65 countries. Also, with the addition of the Idaho College of Osteopathic Medicine (ICOM), there are now 34 accredited osteopathic medical schools in the United States at 49 locations in 32 states. As we celebrate this landmark and the significant growth that our profession has seen since Dr. Still opened the American School of Osteopathy, I believe it is important for us to look back with pride and humility on the people and ideas that paved the way for osteopathic medical education to become the distinct pathway for training physicians that it is today. Just as Dr. Still did so many years ago, we should encourage our students to carry their osteopathic training and philosophies with them throughout their careers, as well as a thirst to question, pursue curiosity, and collaborate. Only then, by continuing to expand our knowledge and understanding of the science and art that is medicine, can we truly carry on the legacy set forth in Kirksville in 1892 and continue to advance medical education in the future. Andrew Taylor Still & “Official Family.” Courtesy of the Museum of Osteopathic Medicine, Kirksville, MO.